A better than expected waterproof boot for the price. Motorcycle footwear choices. 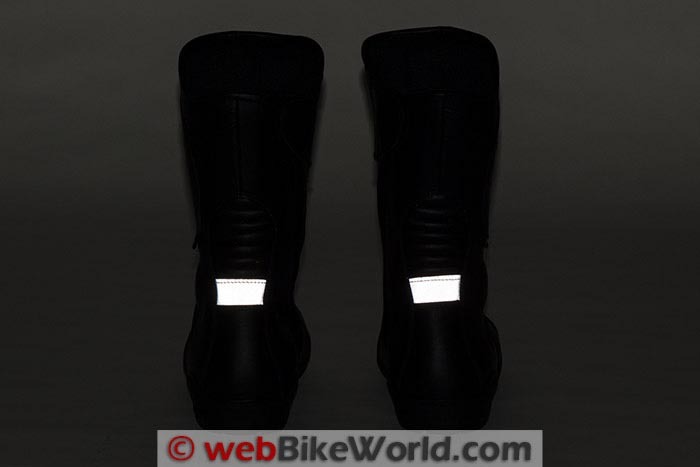 I think newer riders may not appreciate the wide variety of boots (and shoes) we have today that are made specifically for motorcycle riders. It wasn’t too long ago that the only choice you’d have to make would be dirt bike boots, combat boots, or hiking boots for motorcycle riding. Motorcycle racing boots were (and are) a rather niche market and dealers didn’t stock many and what they did have was pricey. 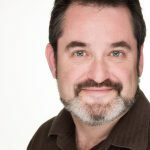 In the past I have worn both hiking boots and combat boots for motorcycle riding and at the time I felt like the protection they offered would be more than I would ever need. But now I have become obsessed with discovering every protective feature that I can when I’m examining a new pair. This obsession may mean that I’m spending a lot of time on the web researching new purchases, but it ends well for webBikeWorld readers, who are just as obsessed with the details. Aeromoto is another “house” brand of Competition Accessories. 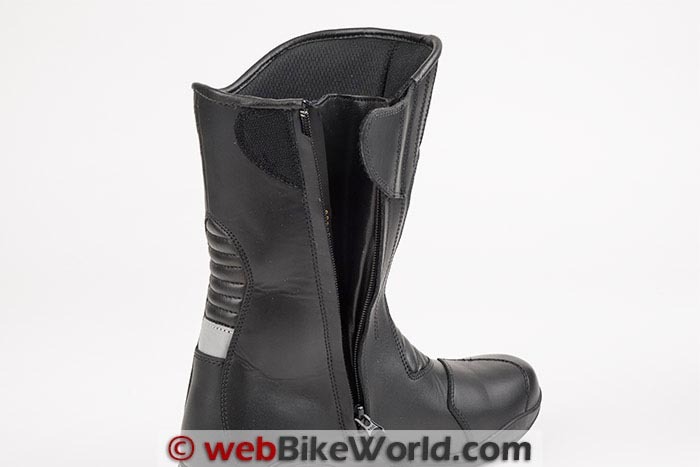 The Aeromoto Dry Tour boots are also available as a waterproof ventilated version, the Aeromoto Air Tour boots. The Aeromoto Dry Tour boots are reasonably tall, measuring 11 inches (28 cm) from the bottom of sole to the top of the zipper. Internally, the distance from the insole to the same point at the top of the zipper is 10.25 inches (26 cm). On the front facing portion of the boot, the height of the upper rises to 12.5 inches (31.75 cm), which provides a bit of additional coverage to the shin. 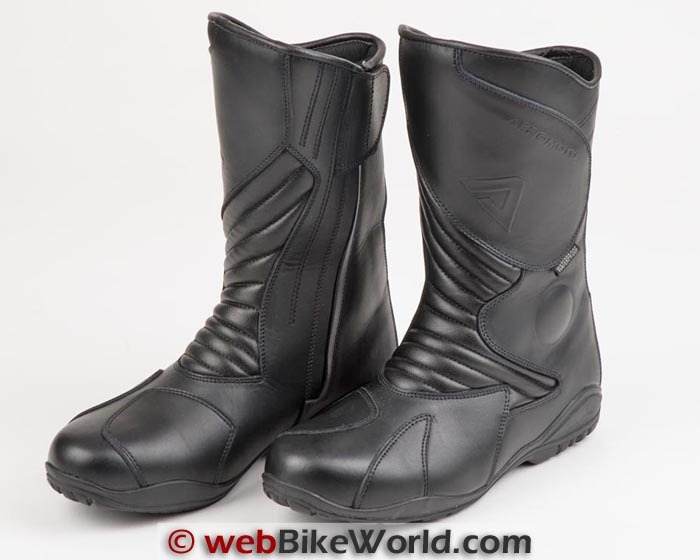 In appearance, the Dry Tour boots are what I would call a typical motorcycle touring boot. They are black, with a leather upper, and they zip up on the side. You’d have to look rather closely to spot any branding on the boots. 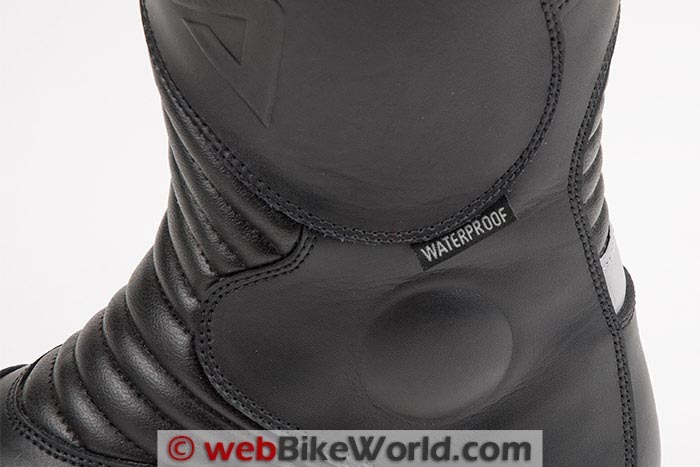 There is an “Aeromoto” logo and an “A” graphic thinly embossed on the front of the boot and just below that, a small tag that simply says “waterproof”. The boots probably wouldn’t earn a second glance as far as styling is concerned — but don’t let that fool you (as it did me). There’s truly a little more than meets the eye. For one thing, the liner reaches all the way to the top of the zipper. I find this interesting, as I have seen many other inexpensive (and some not so inexpensive) boots where the liner sits an inch or more lower. This is especially important in the case of waterproof boots to maximize their ability to keep the water out. In fact, this was my first sign that perhaps the Aeromoto Dry Tour boots were indeed a little different than the norm at this price point. As I mentioned, the Dry Tour boots are made with a leather upper and they have a rubber (or rubber-like material) for the sole. The type of leather is not specified (nor is the country of manufacture) and at first it felt rather stiff out of the box. However, it only took a couple of rides to notice that the leather had already started to break in and it felt noticeably more pliable. This was another surprise for me, considering the list price. While the leather never became “buttery soft” or any other phrases that could describe a high-quality leather product, it was better than I expected. The soles have a series of deep channels cut into them and some are cross-cut at the front and heel to provide extra grip and dispersal of water. While not being specified as “non-slip”, the soles are soft and grippy and the softness helps make walking easier than other some other boots I’ve tried in the past. The boots fasten with one zipper, located on the inner section of the upper. The zipper is a YKK brand and it has a large pull tab with the “loop” half of a hook-and-loop tab fastener that is used to secure it. 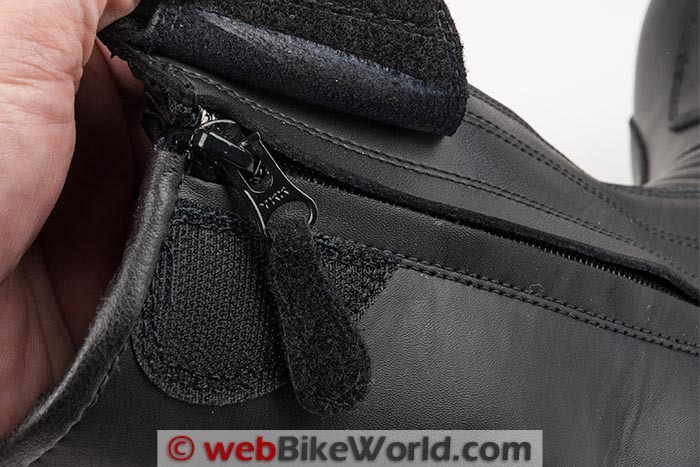 Securing the zipper pull is a section with the “hook” part on the rearward side of the boot at the top of the opening that is covered with a leather flap from the other side of the opening. When fastened, the zipper pull and tab are covered and sandwiched between those two hook-and-loop pieces. Inside the zipper is a large gusset that maintains the waterproof integrity of the zipped sections. The material looks like leather on one side and nylon of some type on the other, but I cannot verify the exact materials used. The remainder of the boot lining feels like a smooth nylon mesh with a bit of cushioning. The cushioning is most likely the HiPora waterproof membrane used to keep these boots waterproof (we’ll get to that a bit later). Most major seams around the boot are double-stitched and it all appears to be very even and tight. The edge where the sole is bonded to the upper is done cleanly, with only slight hints where the bonding glue has overrun the edge. This is much cleaner than, for example, the RS Taichi RSS006 boots (review) that cost nearly twice as much as the Aeromoto Dry Tour boots. 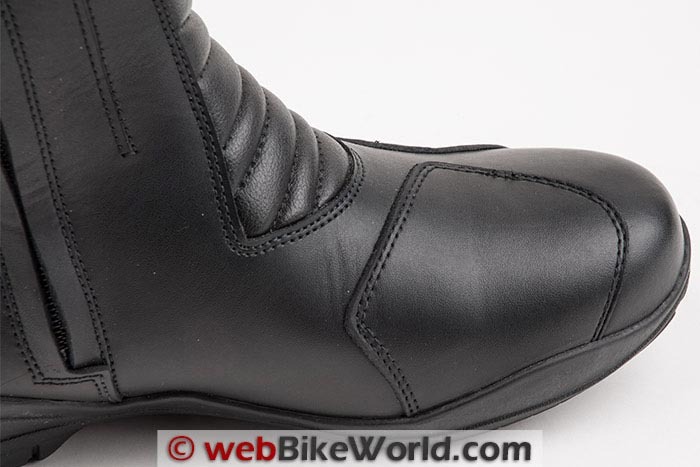 The fit and comfort of the Aeromoto Dry Tour boots were another surprise in their favor. Starting with the sizing, I would say they are very close to being spot-on to the label. I wear a size 10.5 (US) in most shoes and boots and these are marked Euro size 44/US 11. They fit me as I expect a size 11 should, with just a bit of extra room but not so big as to feel too loose. I was surprised to discover that the Dry Tour boots are also available in several wide sizes throughout the available sizing range. This is something I haven’t seen often for motorcycle boots and certainly seems rare at this price point. I mentioned earlier that the leather felt stiff out of the box but broke in surprisingly fast. The flexibility of the boot is helped by a large section of pleated leather on the front of the boot and a smaller section on the back over the Achilles tendon. The front panel is much more generous in size than what I have seen in many other boots and makes walking around in them easy. Inside there is a thin (1/8 inch) removable insole that provides a small amount of cushioning. Under the insole is more of the same nylon and HiPora liner that runs around the rest of the interior. This has the benefit of adding some needed additional cushioning in addition to the thin insole and also conspires with the flexible upper to make walking easy. Since the Dry Tour boots are claimed to be waterproof, I expected them to feel a bit “stuffy” when it came to ventilation…and I was correct. The Dry Tour boots do not breathe very well and, as such, they can get a bit uncomfortable when the weather gets warm. 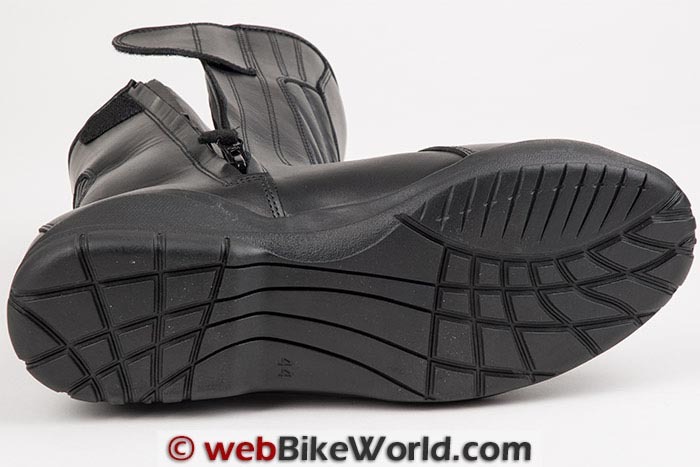 This, of course, depends on how long you will be riding in them at a stretch. Since the Dry Tour boots are designed for touring, you won’t find any hard plastic or carbon fiber bits bolted on. Instead, there are some additional layers of leather in strategic places on the outside. Over the toe box there are two patches of leather, one in place as a shifter pad (mirrored on the right side boot as well) and another smaller patch to the anterior side for some extra protection from abrasion in a slide. There is also an additional leather panel running from the top of the front of the boot that cuts across the flex panel and around to the anterior side of the boot. While this does provide extra abrasion resistance, it does provide some impact protection too, if not a lot of it. Around the front of the toe box there is some additional strengthening that can be felt inside. It is not terribly strong like a steel toe might be, but it is there and it’s better than nothing. Likewise, the heel cup area gets a similar treatment. It is hard to determine what the strengthening material is that is being used; it may be rubber or a soft plastic. Speaking of which, there are two rubber (or soft plastic) discs in each boot on either side of the ankle bones to reduce impact there. The anterior one is easy to spot as its position is visibly embossed in the leather. The inside one cannot be seen but it can be felt by squeezing the correct area next to the zipper. There is one other feature that I look for in motorcycle boots but I’m not sure if the Dry Tour boots have it or not — that is, a shank of some kind in the sole. The center portion of the soles do feel pretty stiff, but I’m able to bend the sole in my hands (albeit with some serious effort) in ways that would damage a foot if it were in there. Around the back behind the Achilles tendon is a small patch of reflective material located just below the pleated stretch panel. It doesn’t look like much in the daylight but it does light up rather well in the dark as can be seen in the photo. No doubt some of you are waiting to find out how the Dry Tour boots fared in the waterproof department. Like any boot that claims to be waterproof, I put this pair through the same “Bucket Test” that we do for waterproof gloves. The Dry Tour boots were set to task by submerging them for a full five minutes in a bucket of water to see if there was any leaking. The boots are so tall, however, that I was only able to reach up to about three inches away from the top of the liner (equivalent to about eight inches from the ground). Still, I was very interested to see how these inexpensive boots fared. I held them submerged for a full five minutes and I am pleased to report that during that time the interior of the liner remained completely dry. I could, however, feel the liner getting heavy around my hands as water began to settle in between the leather and the liner. Once I removed the boots from the water I could easily tell they were holding water as they were much heavier than before. I figured it would now take them a while to dry as soaked down as they were so I decided to check on them a few hours later while they sat outside in the sun. They were still a bit heavy and I found when I reached inside, the interior side of the liner now felt a bit damp also. So it seems that if you do get these boots waterlogged, some dampness may seep in after an extended period of time. This was a little disappointing but still a very good showing (five full minutes completely submerged is significant) and this is still much better than many of the other motorcycle boots I’ve tested in this way. 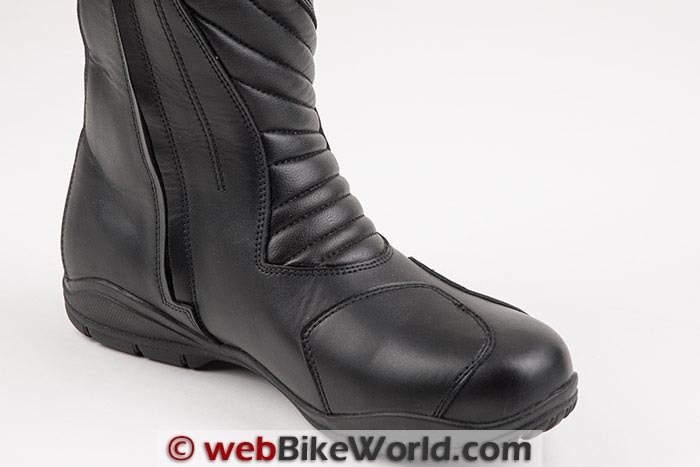 The bottom line is that the AeroMoto Dry Tour boots are very good motorcycle boots. That really sums it up in a nutshell for me. Factor in the $109.00 price tag and they offer a very good “bang for buck” equation. On the positive side, they are comfortable, they break in quickly, and they offer reasonable protection that is in line with the average touring boot. They also have subtle styling which may appeal to the target touring and adventure riders. And, they also happen to be waterproof and stood up to the torture test very well. I don’t feel like I can pick at the fact that after a few hours the liner interior was damp; I think in most real-world riding conditions (especially with a pair of waterproof pants over the top of the boots) that this would not become an issue. The only nits I can really pick at would be that the protection in the boots could be a bit tougher and that a shank could be added to the sole. I think for the price point though, these sorts of issues are acceptable. My final word is that these are good boots that also happen to be a very good value. Sizes: 8 to 14 US plus 9,10,11,12,12.5,13,14 in Wide.